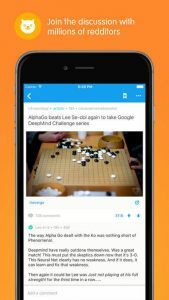 Get the official Reddit app to discover all the top trending topics, breaking news, viral videos, funny jokes and hot memes. The freshest content on the internet brought to you in one app, with infinite scroll, autoplay GIFs, and the fastest-loading interface of any Reddit app. Looking for news? Check out news! Need some funny jokes? Head on to Jokes and pack a spare pair of dry pants. Or maybe you’re passionate about cats being scared by cucumbers. We are too, at CucumbersScaringCats! There’s a subreddit for anyone (and everyone) to share, vote and discuss just every topic imaginably. You can post it, you can share it, and you decide what is hot or not by upvoting and downvoting content. Get the socially curated, constantly updated feed of the news, fun stories, pics, and videos that interest YOU. Or what interests millions of other users on popular. Unlike other social networks, on Reddit you can be yourself with your Reddit profile and persona, disconnected from your real-world identity. So your mom won’t know you’re into knitting. Tired of mildly interesting content and monotonous updates on social media feeds? Find the stories and conversations that matter to you. From entertainment news and politics to fun DIY projects and cats (lots of cats) – create your own feed of subreddit subscriptions to never be bored again.